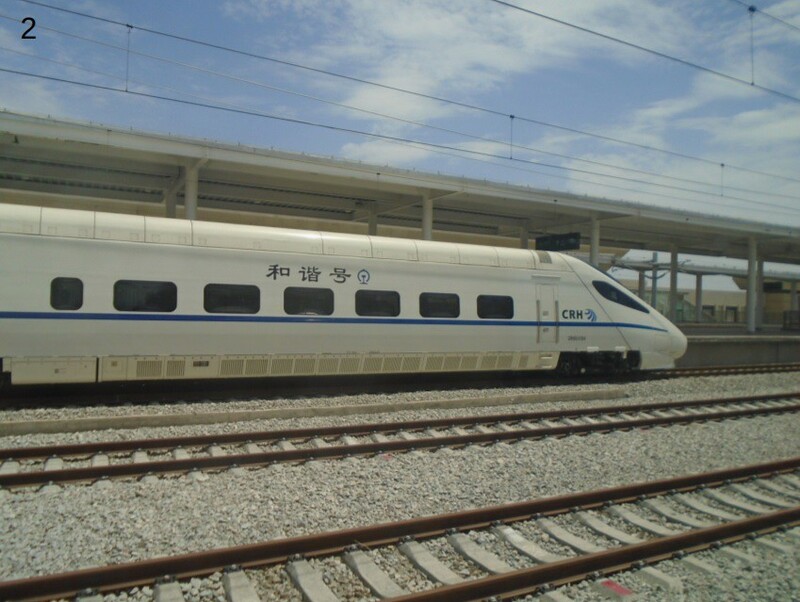 In recent years, China has substantially increased the size of its railway system and has overtaken long-standing leader India in total passenger travel. As a result, it has become far more convenient to travel longer distances by train. 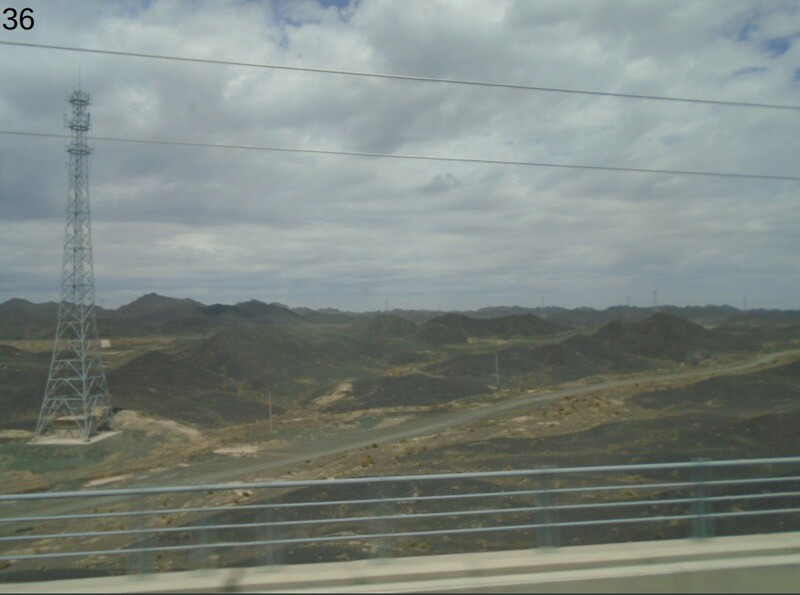 One intriguing newer route runs from Lanzhou (capital of Gansu) to Urumqi (capital of Xinjiang) at top speeds of over 120 miles per hour (200 kilometers per hour). 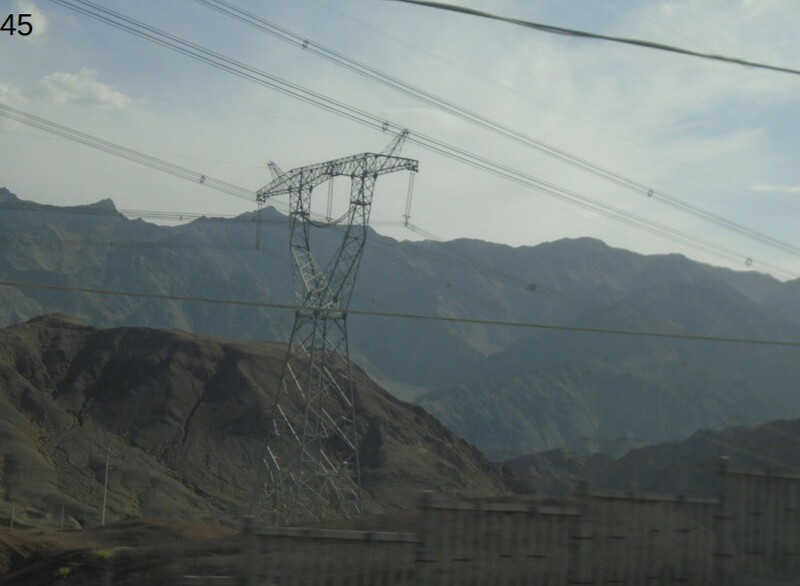 According to Railway Technology, this electrified route is 1,104 miles long (1.776 kilometers). 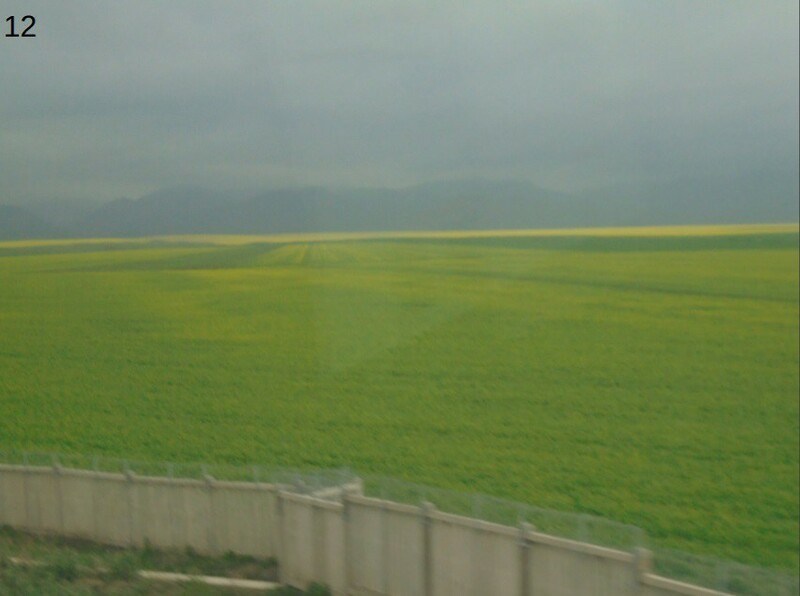 I recently took that round trip, arriving in Lanzhou from Guangzhou (an 11 hours 29 minutes, 1,670 mile/2,687 kilometer train trip). This article describes the trip and includes photographs. 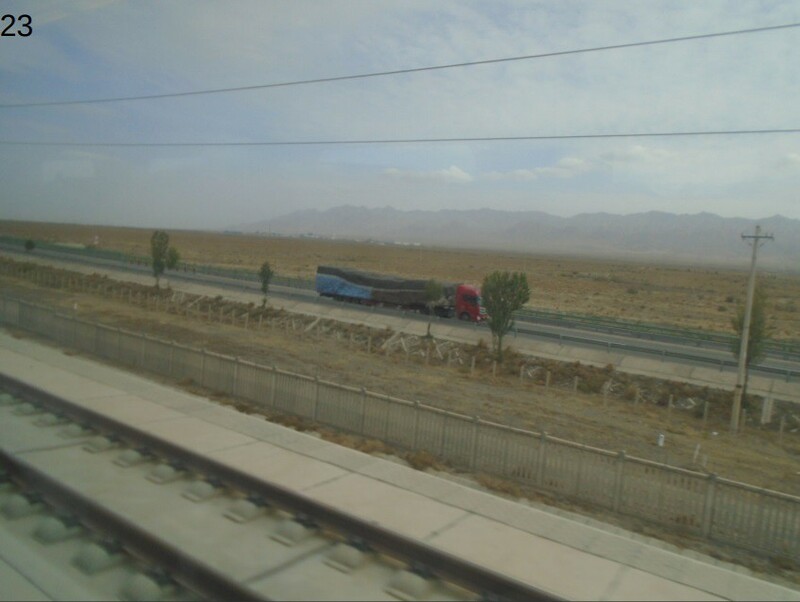 My train to Urumqi, Number D-2701(Images 1-3) is one of four trips each way on the new route and had a 11 hour, 23 minute terminal to terminal scheduled travel time, though other high-speed trains can take up to between 12 and 13 hours (Note). A map of the route is here. 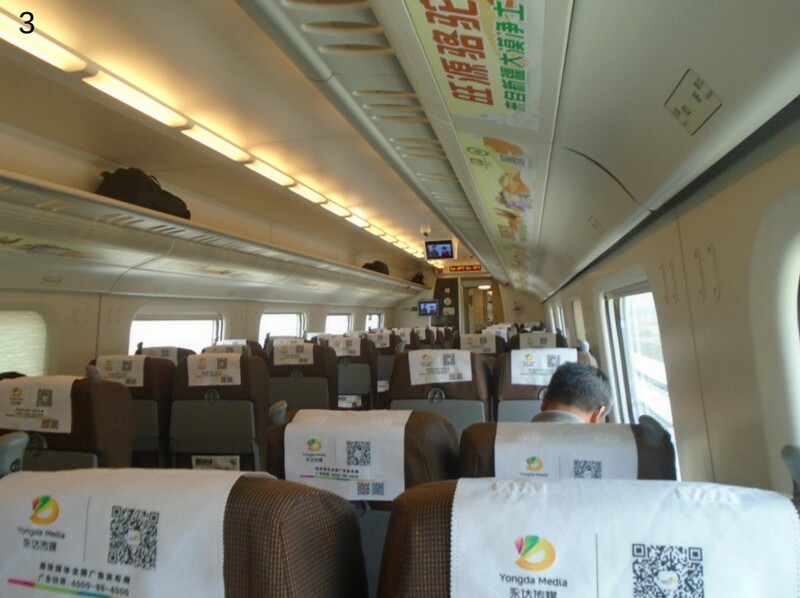 There are a number of other high-speed trains that cover only part of the distance, such as from Lanzhou to Xining or to other points beyond. 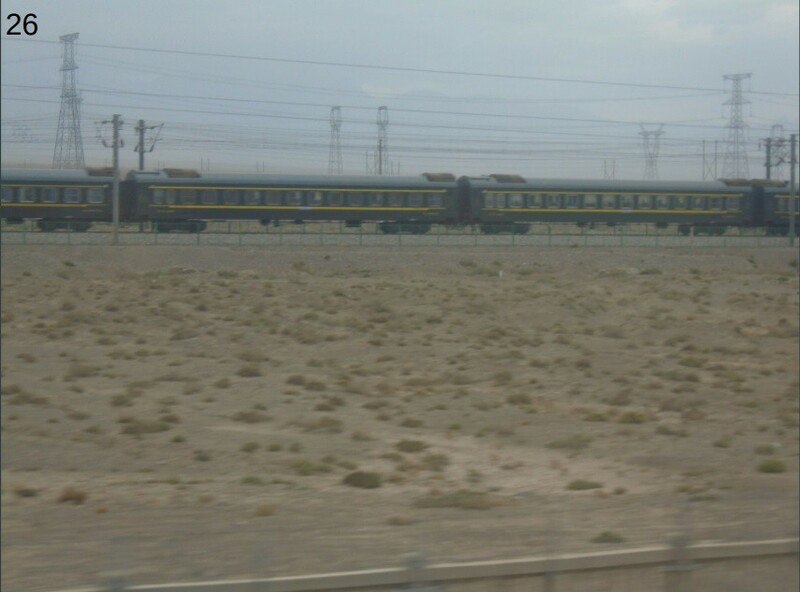 In addition, there are also conventional trains that generally operate over the route on the parallel older line (also electrified). 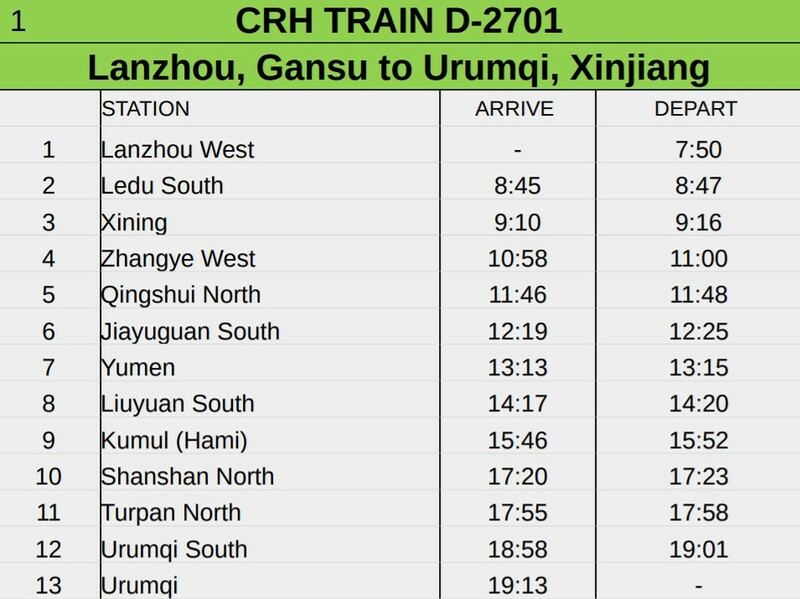 These trains can take from 16 to 27 hours. 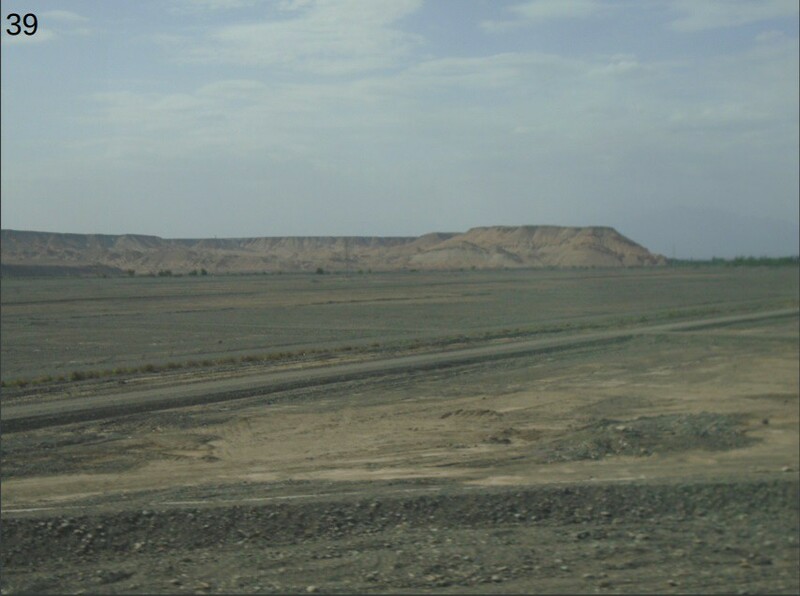 The route across the Gobi Desert follows the Silk Road, with its oases. 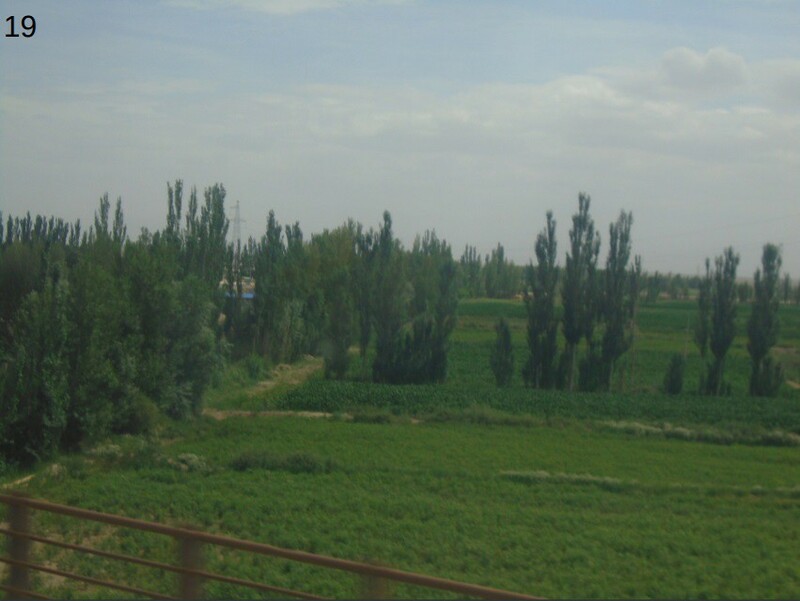 As a result, there are a number of small verdant sections of greenery and agriculture, generally near the urban areas that developed at the old oases. 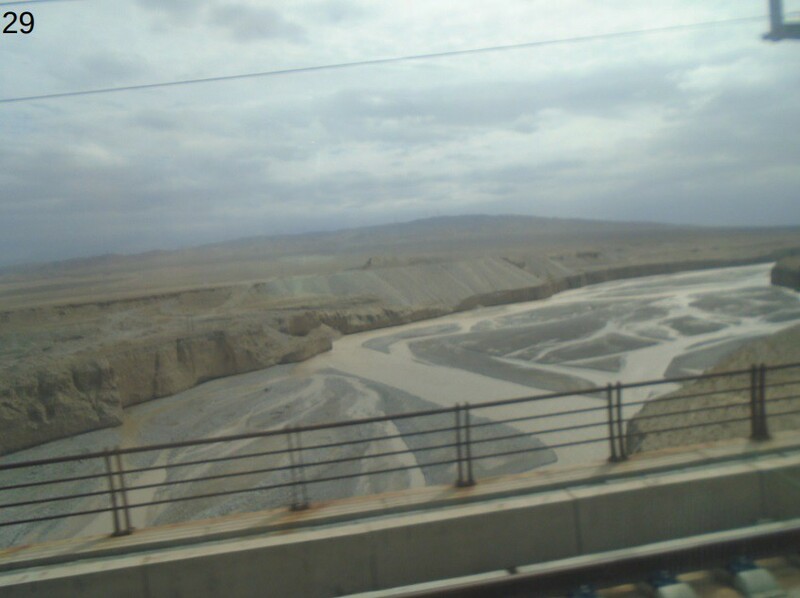 The Lanzhou to Urumqi route starts in the narrow Yellow River Valley and after climbing onto the Tibetan Plateau, reaches Xining, capital of Qinghai, and terminus of the relatively new passenger rail route to Tibet. 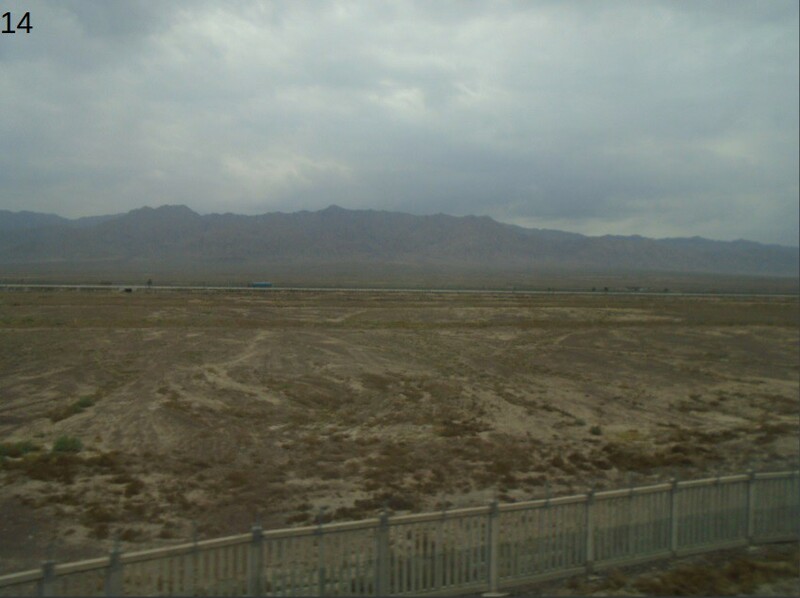 After descending from the Qilian mountains, the route is largely in the Gobi Desert for the rest of the way. 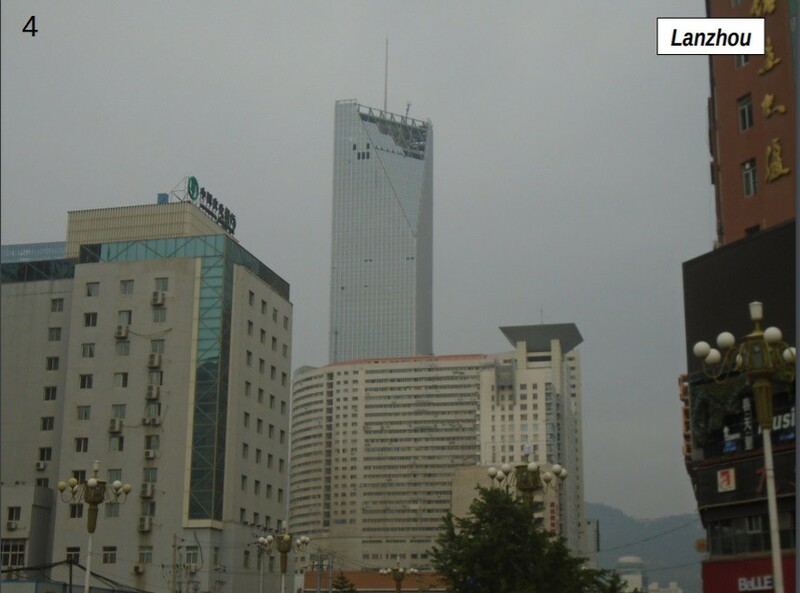 Lanzhou, the starting point of the new route, has an urban area population of 2.9 million (Image 4). 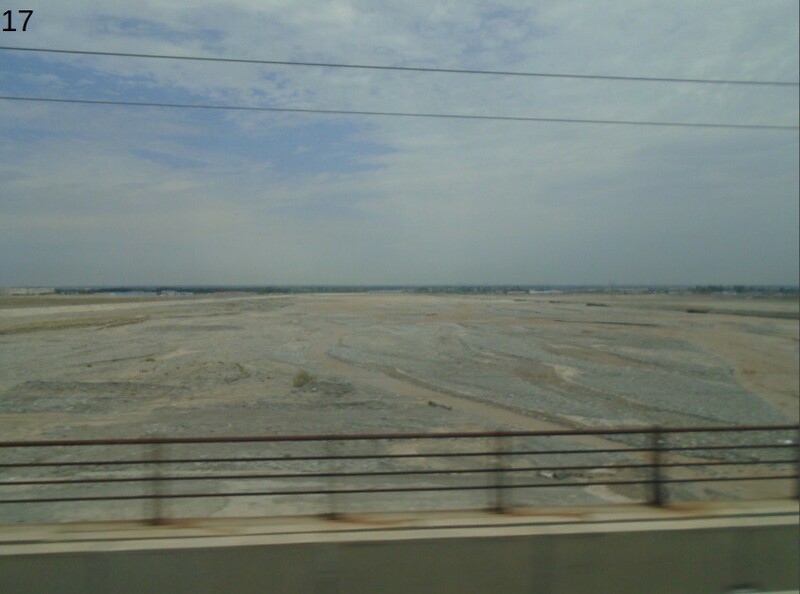 The new railway is a notable feat of engineering. 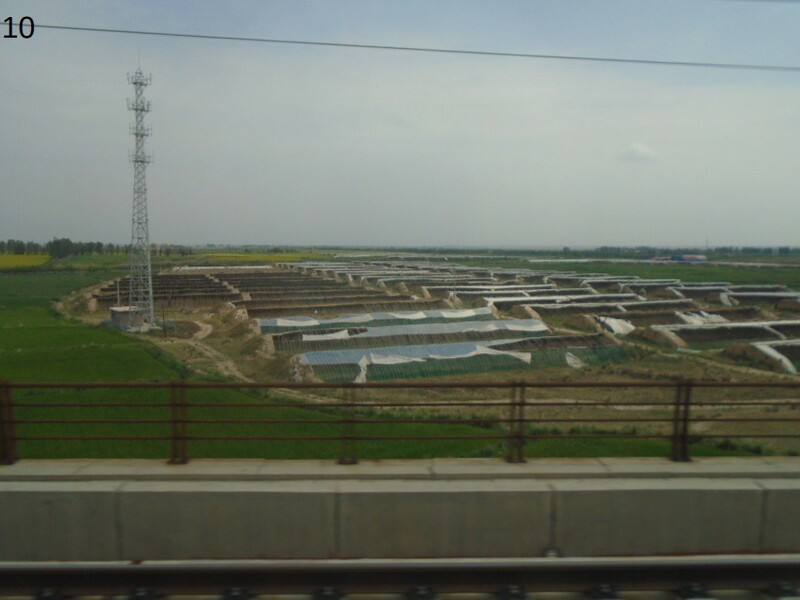 Even before Lanzhou, the mountainous country from western Shaanxi province (capital Xi’an) requires many tunnels to obtain the flat and straight alignment required for high speed trains. 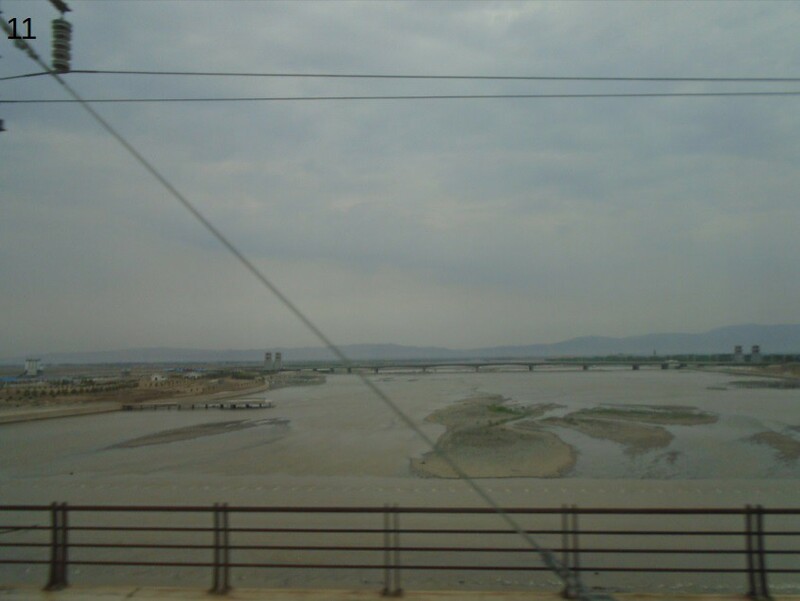 In fact, the tunnels begin in Baoji, even before reaching Lanzhou. 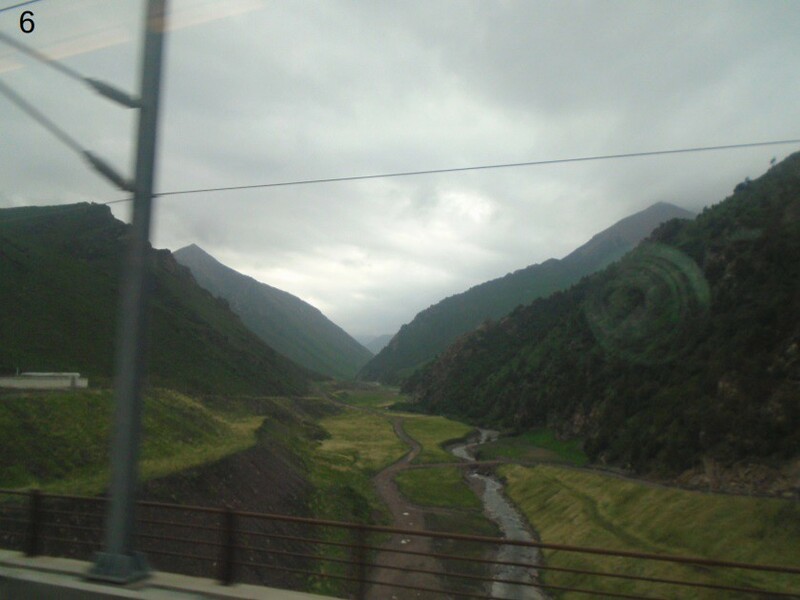 Nearly all of the route from Baoji to Lanzhou, which takes just over two hours, is in tunnel. 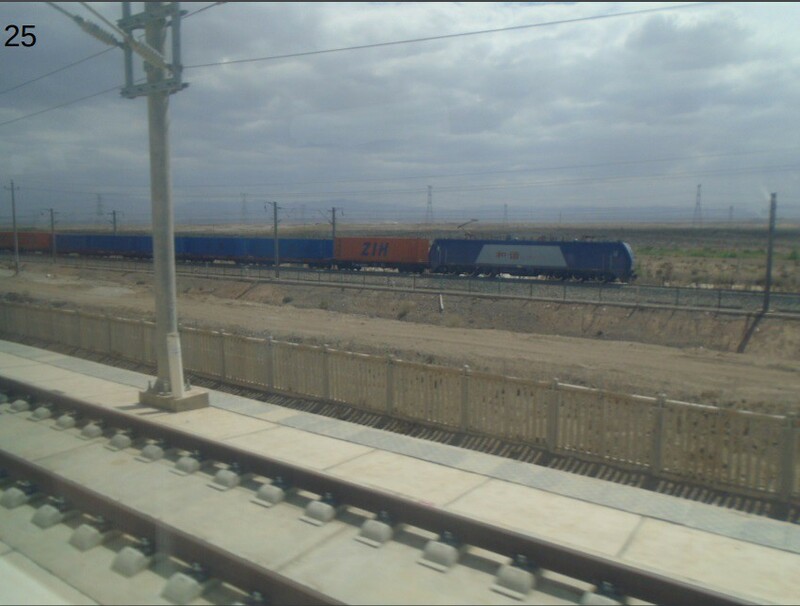 The tunnels begin again shortly after the Urumqi bound train leaves Lanzhou West. 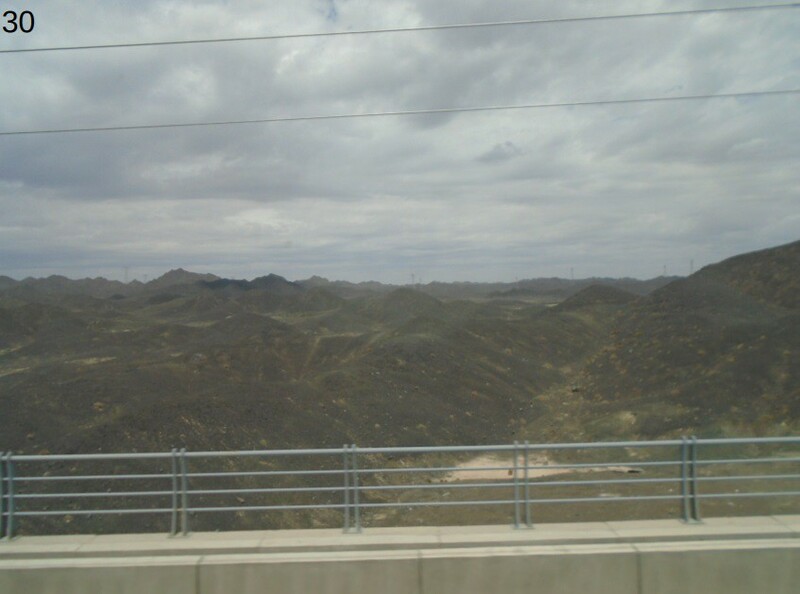 Again, there are only brief periods outside the tunnels to Xining. 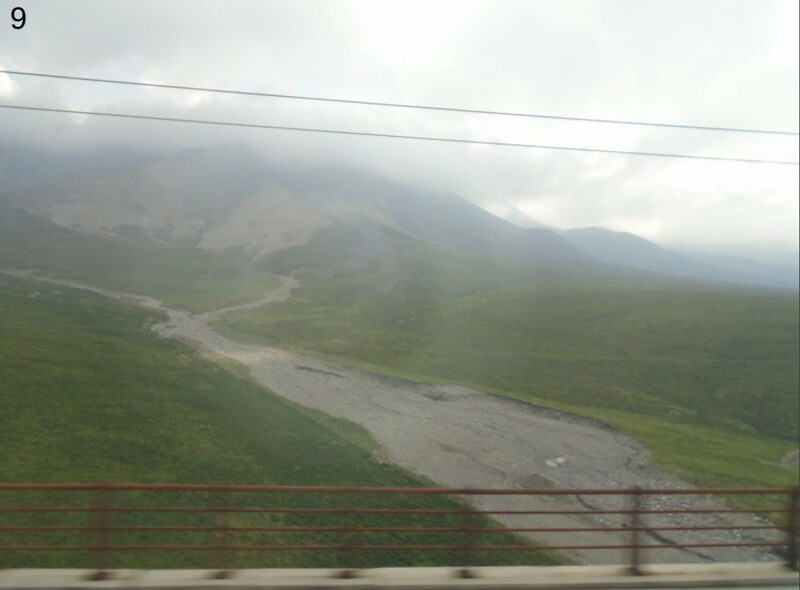 As a result, there is little to photograph in this segment of the trip. 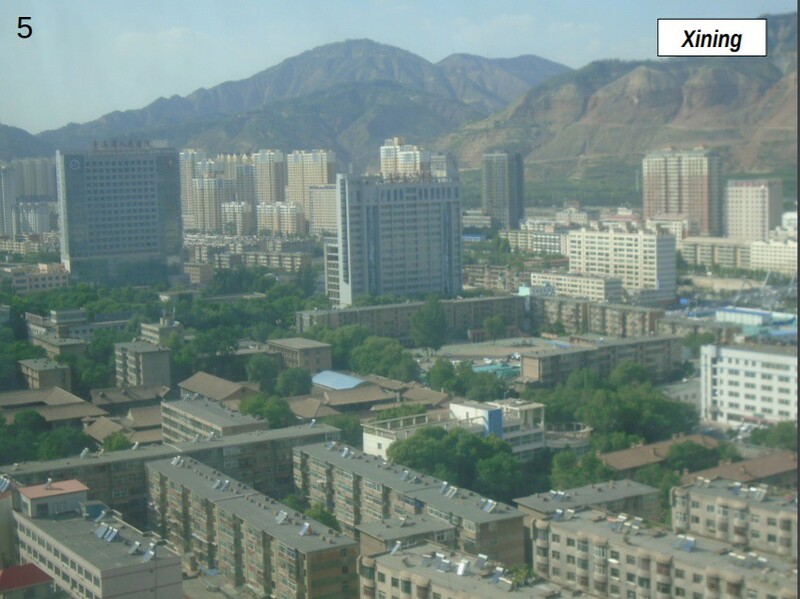 Xining has an urban area population of 1.5 million (Image 5). 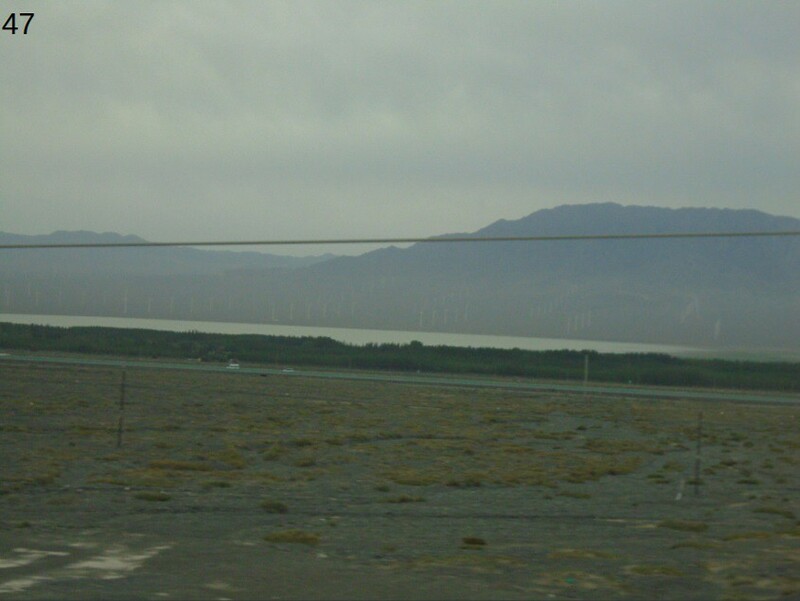 From Xining, at an elevation of nearly 7,500 feet (2,300 meters) the route climbs through a lush green valley (Images 6-7), and soon begins another series of tunnels, with brief interludes. 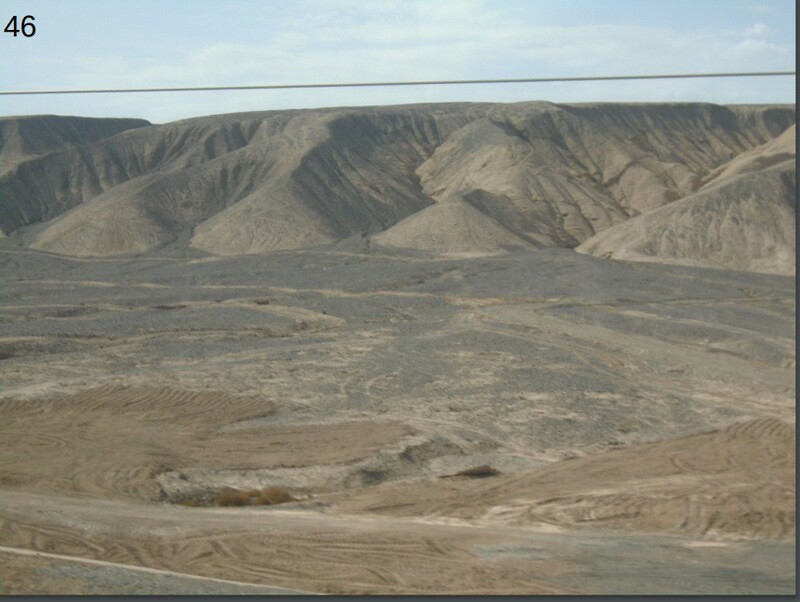 Where these sunlit portions occur, you can see spectacular canyons (Image 6), which unfortunately can be missed because the distances between the tunnels can be very short, leaving little time to take a picture. 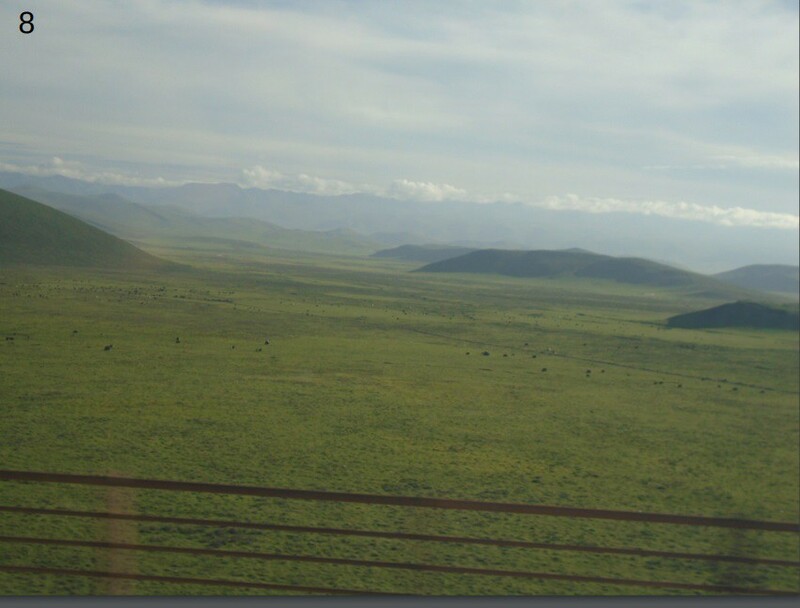 The train traverses the Qilian mountains in a tunnel at 12,700 feet elevation (3,900 meters), then drops to the flatlands that approach the Gobi Desert (Images 8-12). 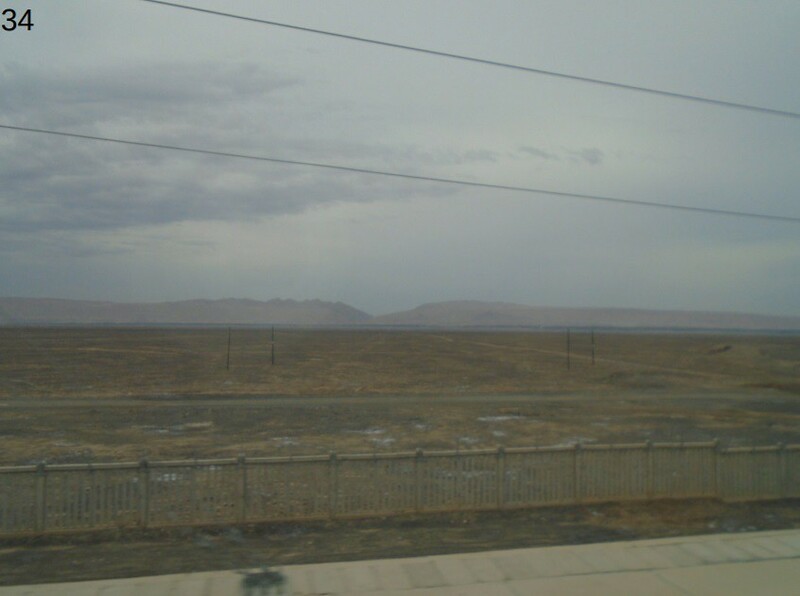 In the process, the train travels back into Gansu from Qinghai. 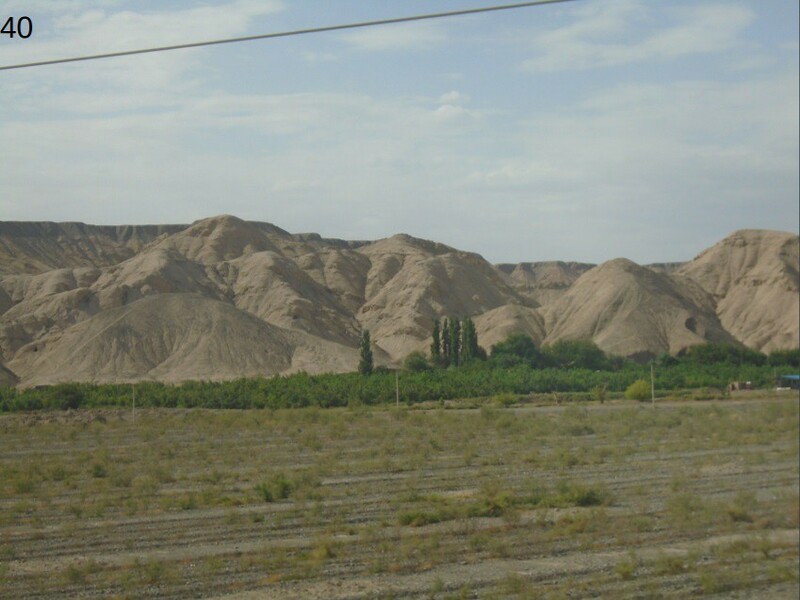 There is considerable agricultural production in this area, around the city of Zhangye (Gansu). 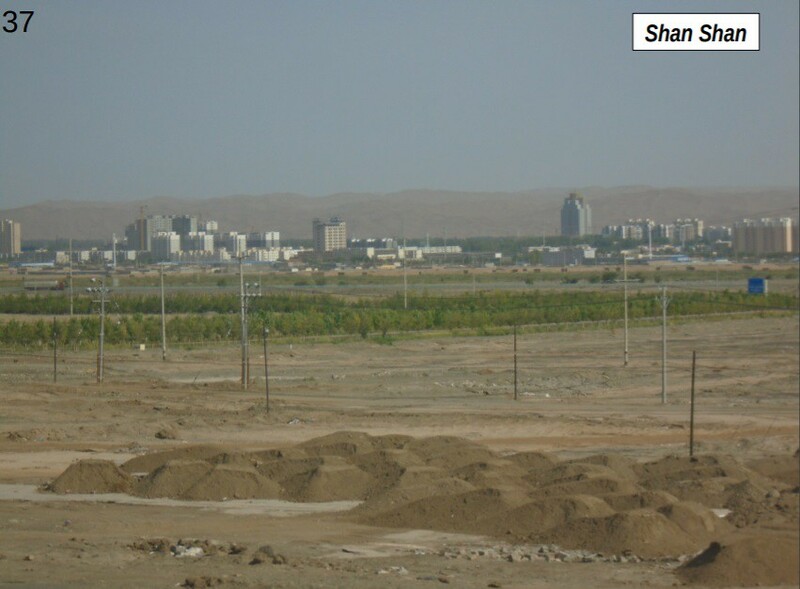 Zhangye is the second largest urban area between Xining and Urumqi, with an estimated population of approximately 500,000. (Image 13). 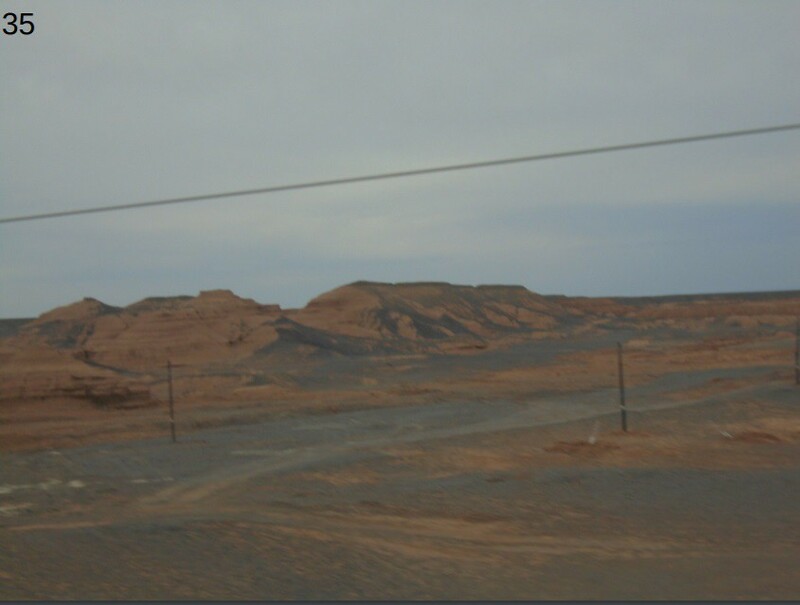 Between Zhangye and Jiayuguan, the scenery changes from generally green and agricultural to the brown and gray/black of the desert (Images 14-17). 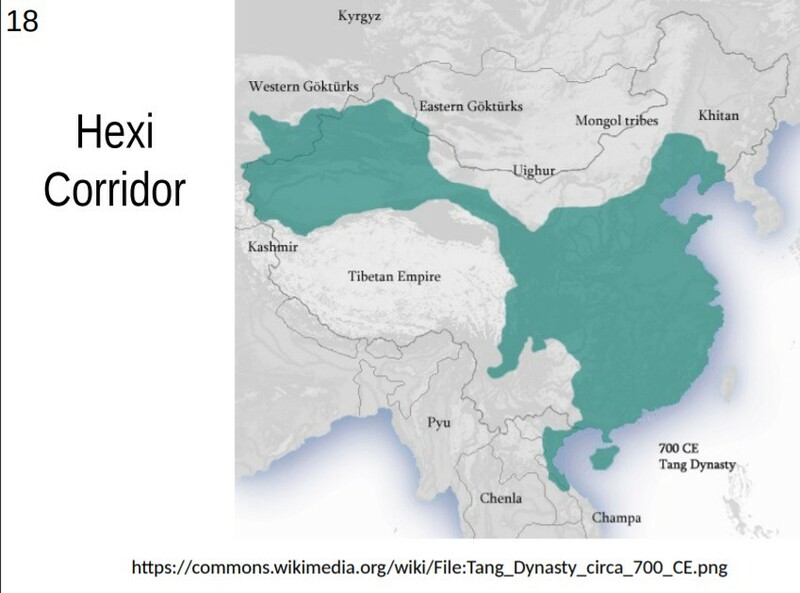 This is the heart of the Hexi Corridor, which was an important link in the old Silk Road, connecting China Proper, to the east of Lanzhou, to the Tarim Basin and Xinjiang (Image 18). 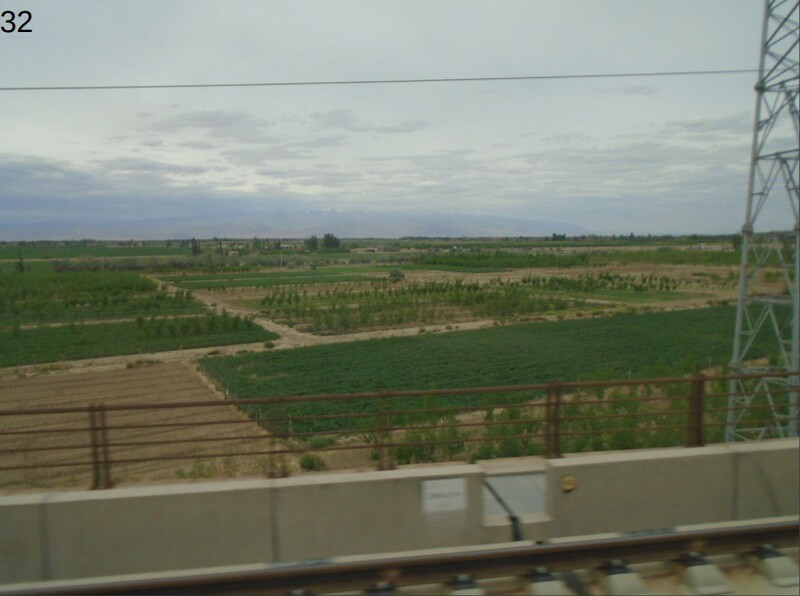 There is also considerable greenery in the Jiayuguan area (Image 19). 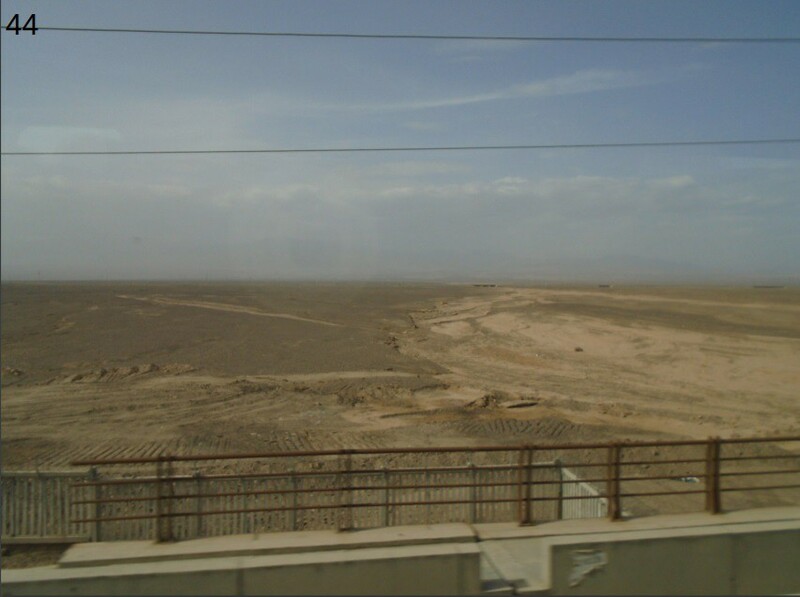 This is the western terminus of the Great Wall of China, though it was not visible from the train. 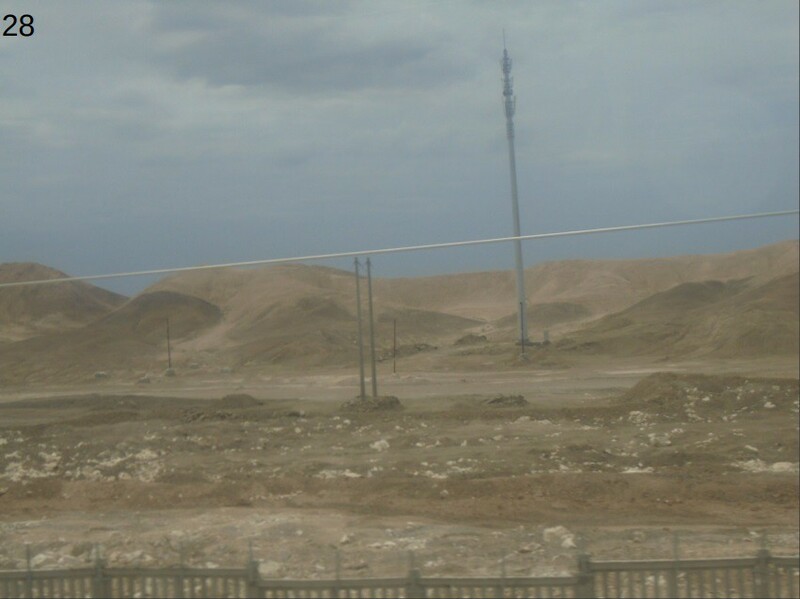 The gravel begins after Jiayuguan and continues to dominate the scenery nearly all the way to Urumqi. 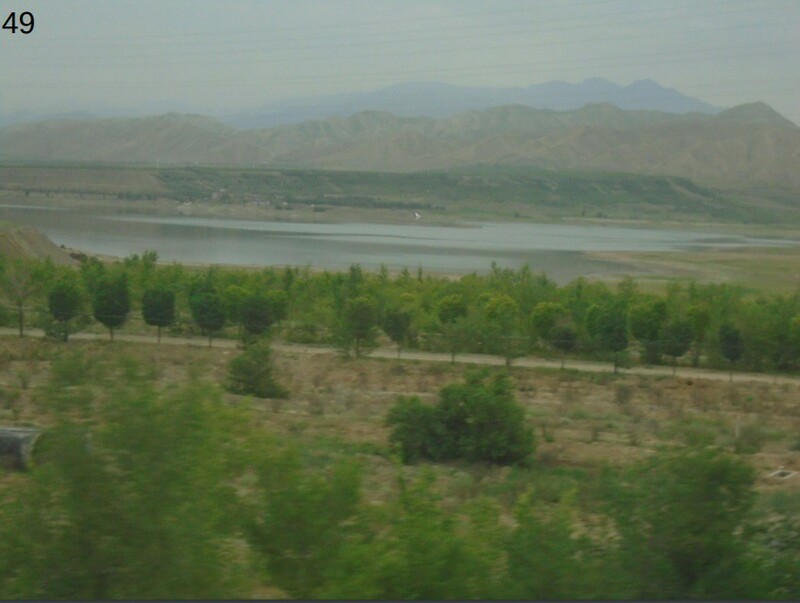 (Image 22). 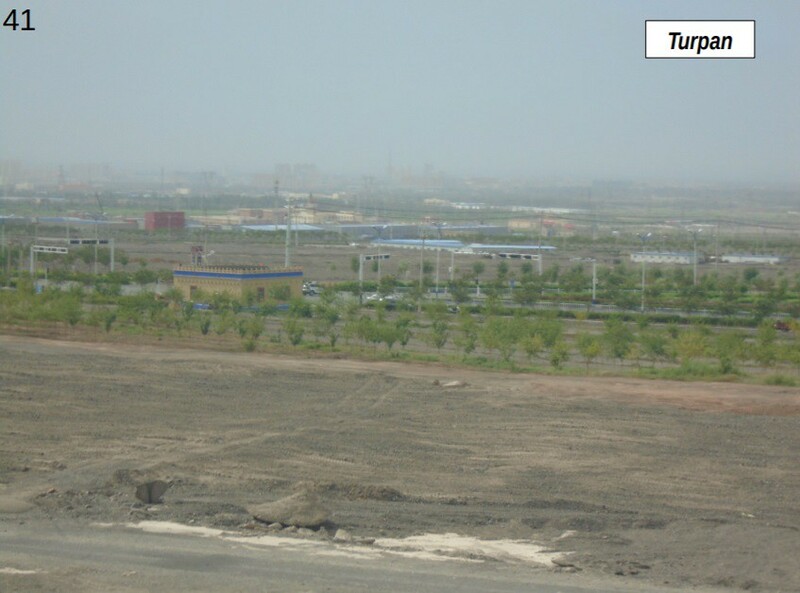 The Lanzhou to Urumqi Expressway (G-30) is adjacent along most of the rail route, and carries considerable truck traffic (Image 23). 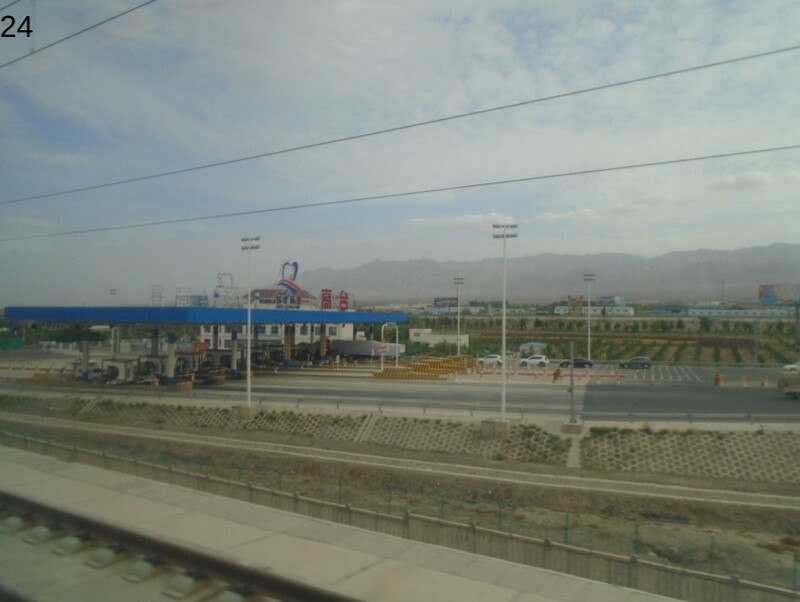 A truck stop and gasoline station is shown in Image 24. 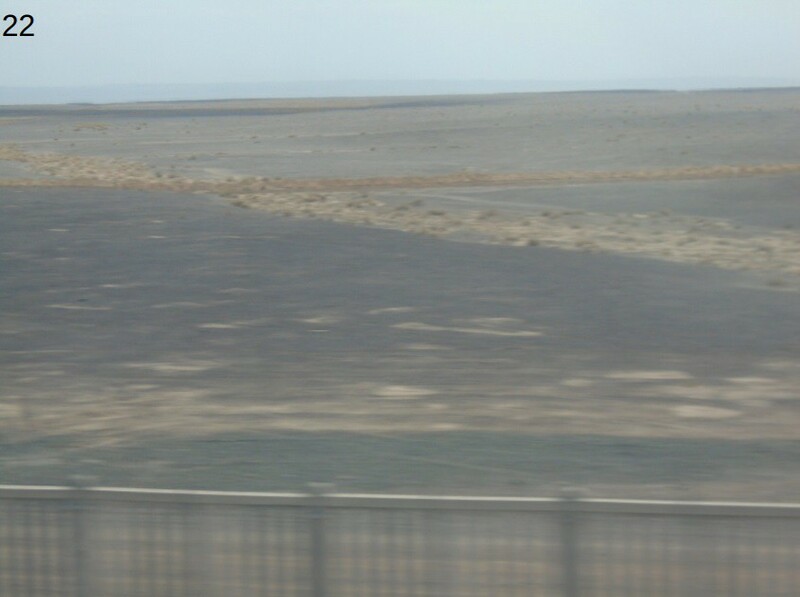 It is also parallel to the old railway line, on which the slower conventional passenger trains (Image 25) and freight trains operate (Image 26). 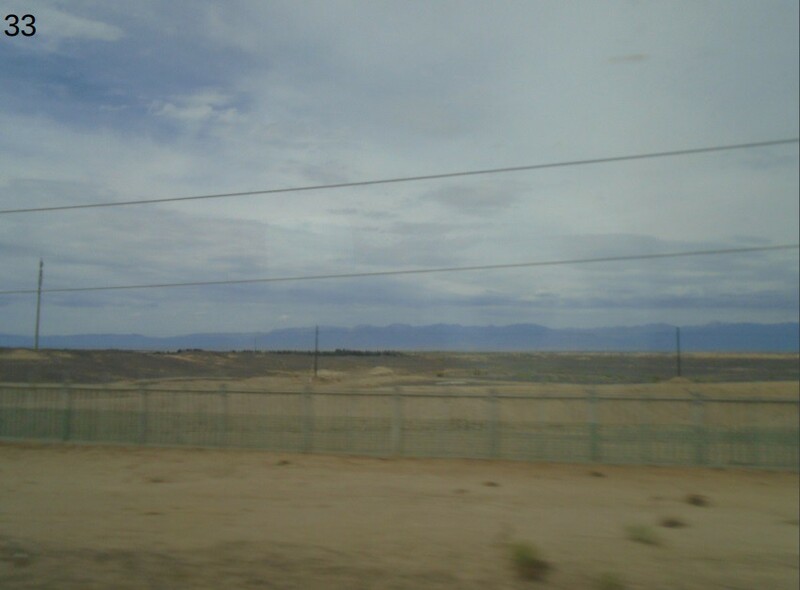 Further, the Qilian mountains are often visible to the south which divide the Gobi Desert from the Tibetan Plateau, such as in Images 23 through 25. 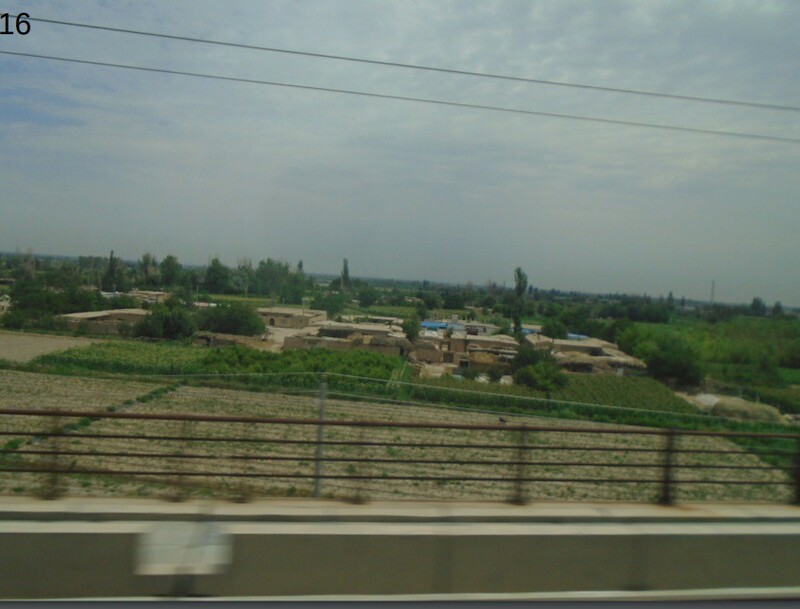 Between Liuyang and Hami, the route crosses the Gansu/Xinjiang border. 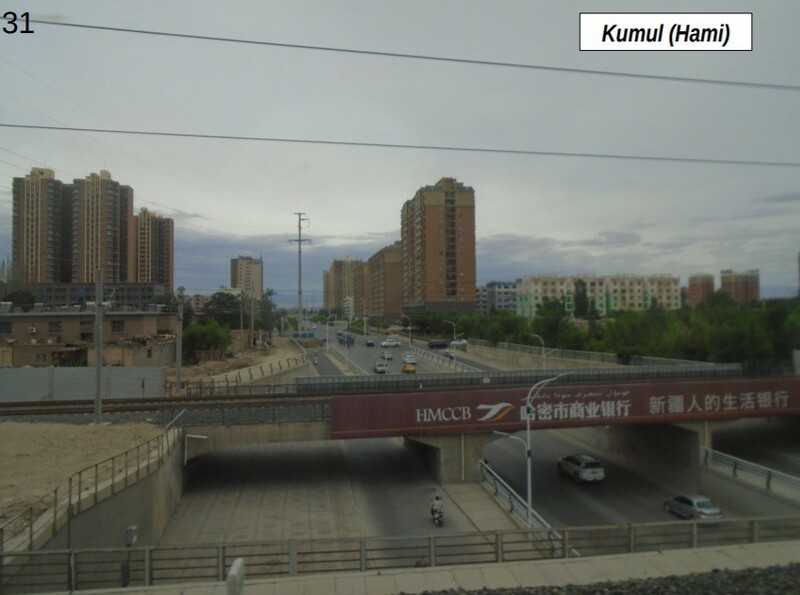 Hami (Kumul) is the largest urban area between Xining and Urumqi, with about 550,000 residents (Image 31), and is surrounded by extensive agriculture (Image 32). 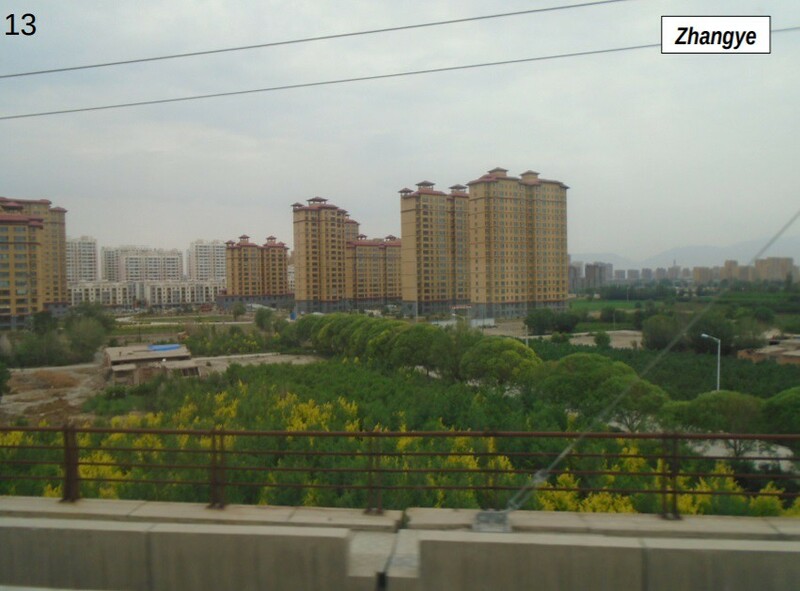 Later, the train passes Shan Shan, an urban area with less than 200,000 population, but with an impressive skyline (Image 37). 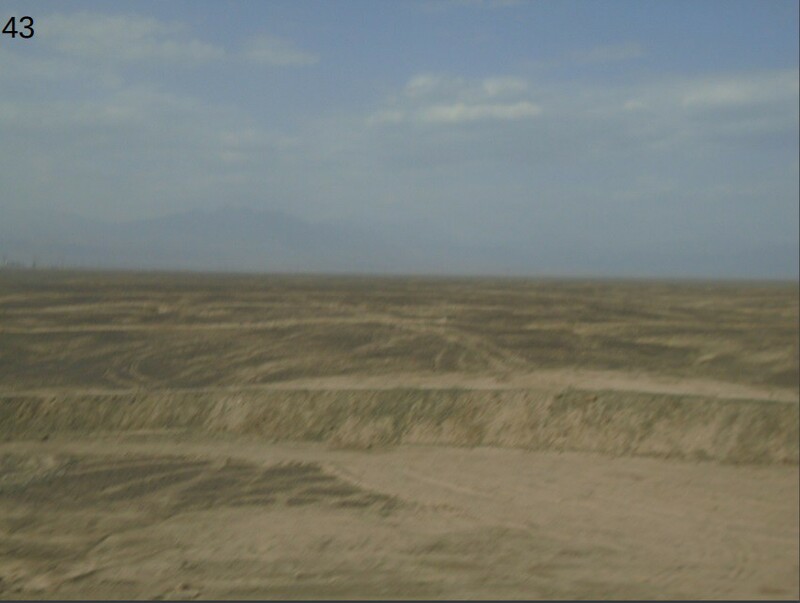 Just south of Turpan (Image 42) is one of the lowest land elevations in the world, at Ayding Lake. 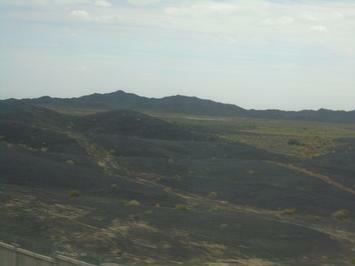 The basin is more than 500 feet below sea level. 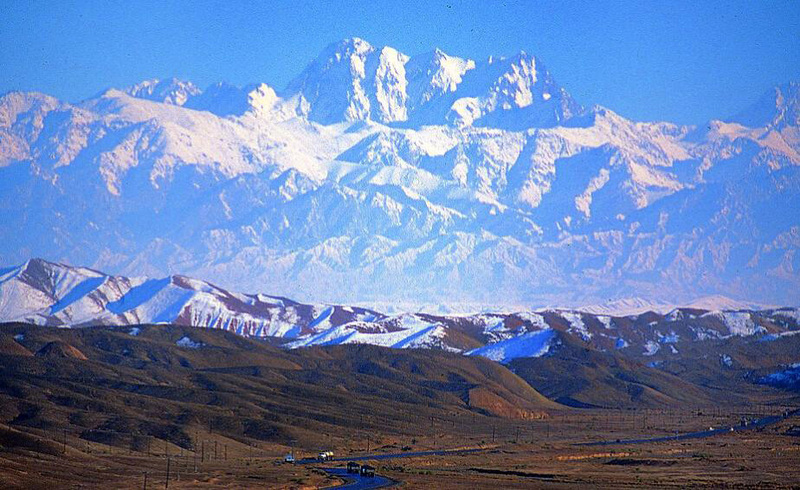 This is comparatively close to Bogda Peak in the Eastern Tien Shan Range (Image 42), which reaches an elevation of 17,900 feet (5,400 meters). This difference of 18,400 feet (5,600 meters) between these two points is substantial and exceeds the better known difference of approximately 14,800 feet (4,500 meters) between California’s Mount Whitney and Badwater in Death Valley (the highest and lowest points in the “Lower 48” states). 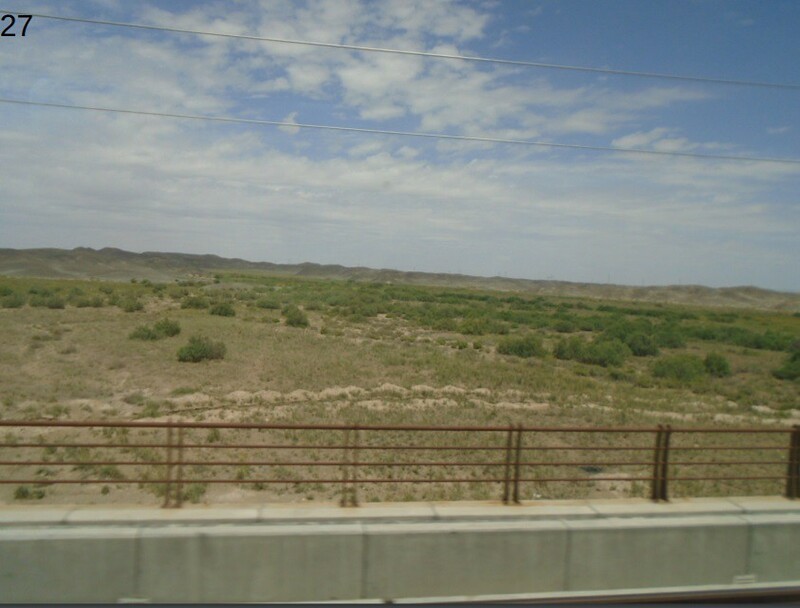 Both distances are about 90 miles (145 kilometers). 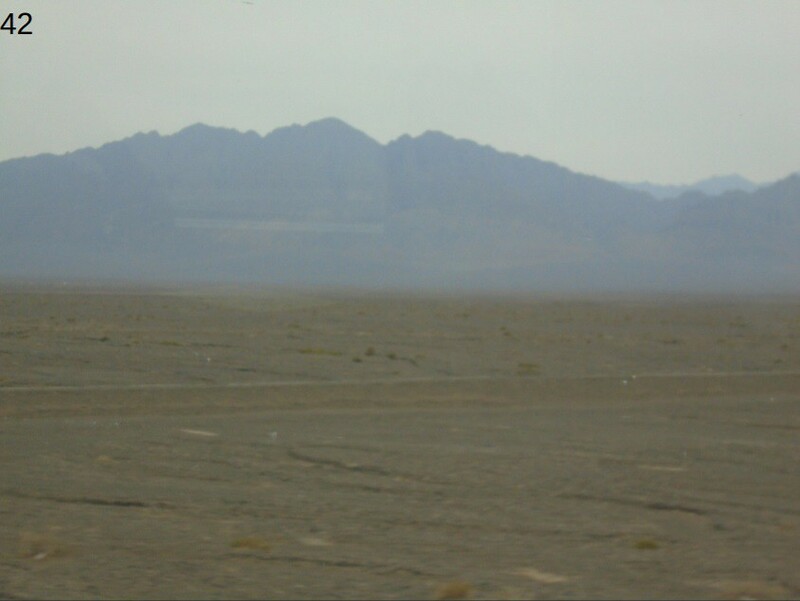 A photograph of Bogda Peak is here. 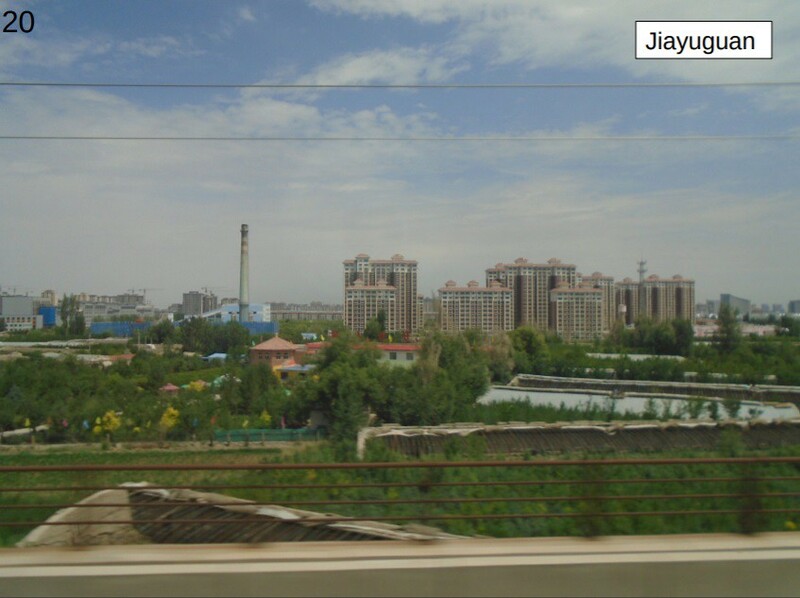 The end of the trip was Urumqi South station, which is adjacent to the older part of the city. 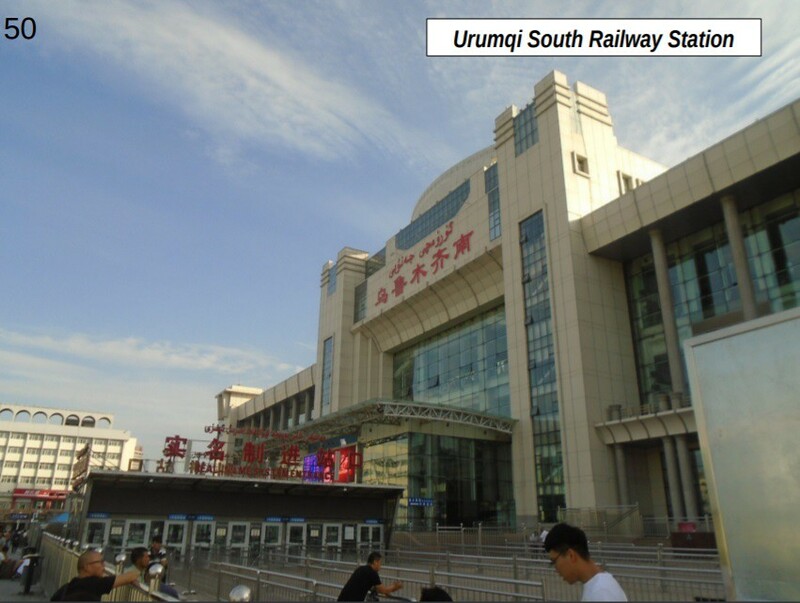 This former Urumqi Station has been replaced by a newer station in the northern part of the city. 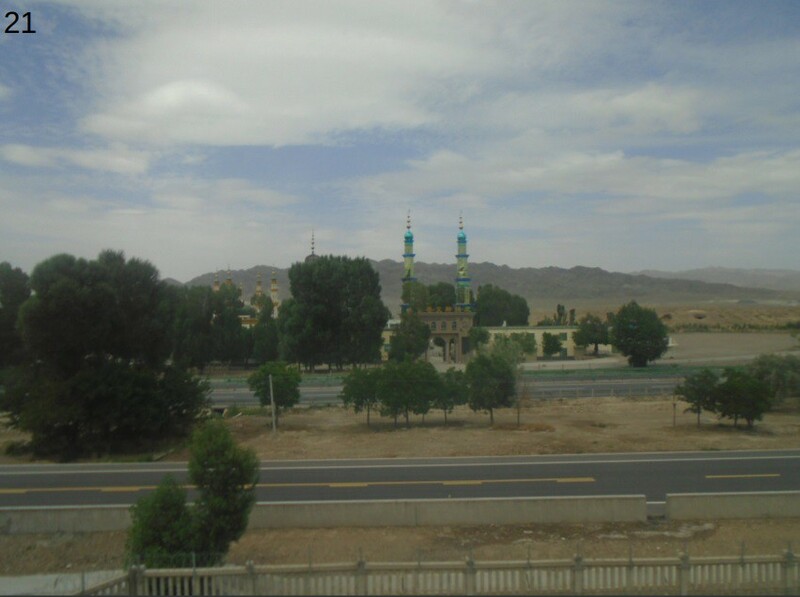 Urumqi (alternate spelling “Wulumuqi”) is the capital of Xinjiang Uyghur Autonomous Region and has an urban area population of 3.6 million (Image 50). 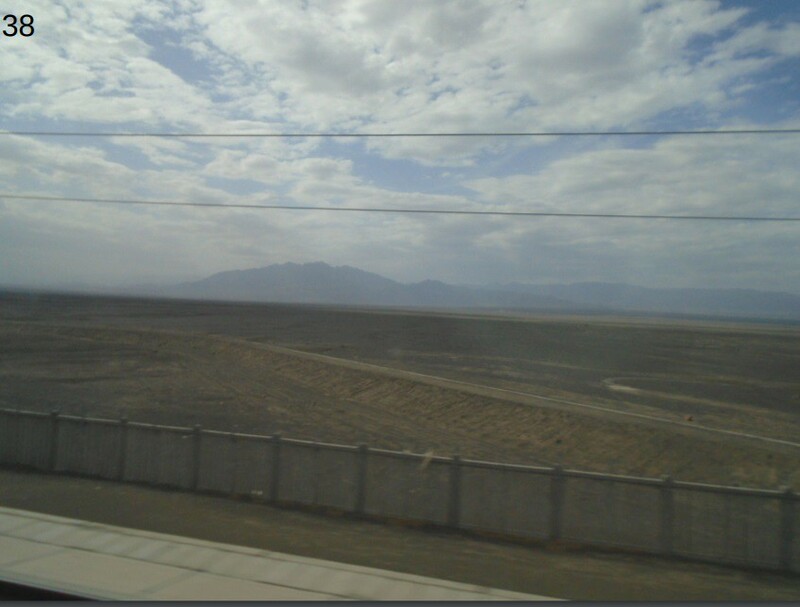 For any interested in geography and topography, the round trip from Lanzhou to Urumqi is two days well spent, opening up a perspective of the enormity of China beyond the crowded, and far more visited, eastern urban areas. 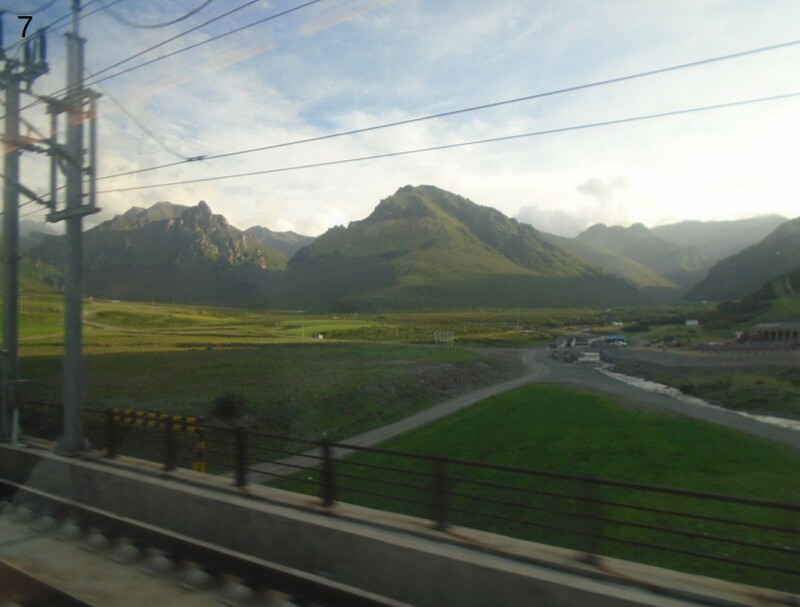 Note: Railway Technology indicates that “The line is designed to be operated with trains running at speeds up to 300km/h. 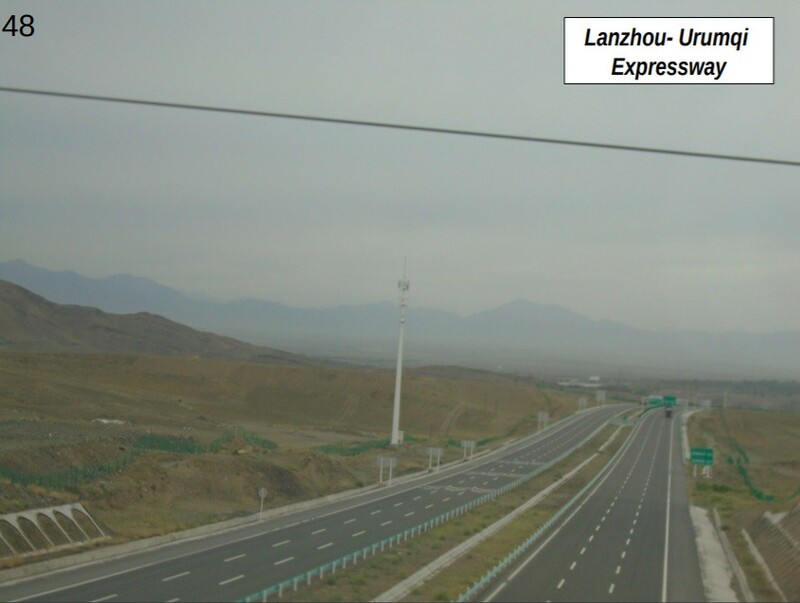 The new line reduced the travel time between Lanzhou and Urumqi to approximately six hours.” The fastest speed I saw indicated on the carriage message board was 207 kilometers per hour. 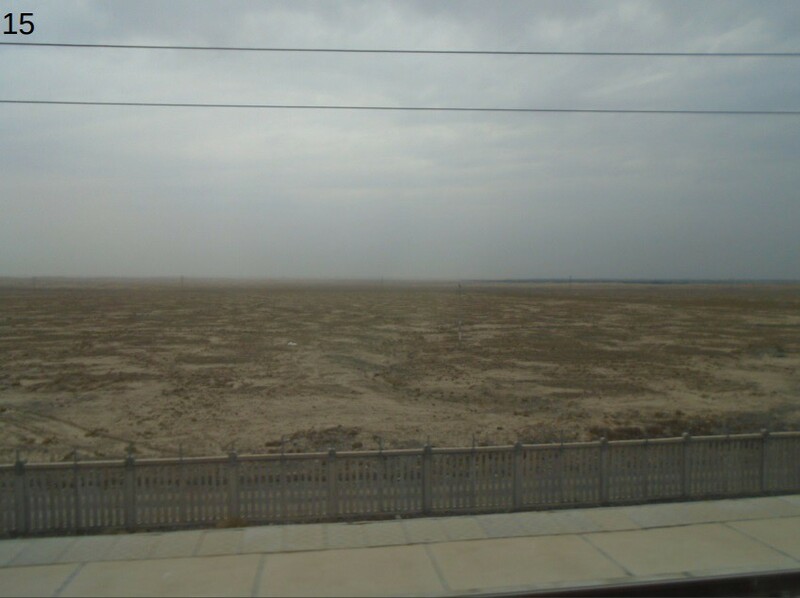 There are no trains that complete the distance under 11 hours, in either direction. Perhaps six hour operation is in the future.